How Far is Arlington County? Arlington County one of the prestigious plotted developments of the builder being located in one of the hot selling residential hubs of Chennai. 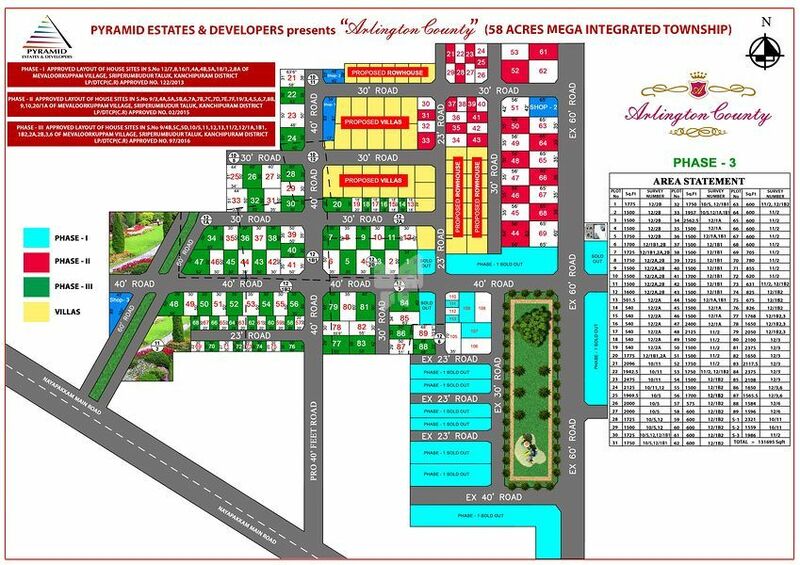 The plotted development is planned over a DTCP approved layout in Poonamalle, Chennai. The project is also available with Commencement Certificate. The project is well planned with maximum space utilization. The plots are available with various dimensions and facings. Pyramid Arlington County is a residential and commercial development in Poonamalle, Chennai. It is one of the constructed projects of Pyramid Estates. The builder has been developing residential projects in and around Chennai and its suburbs. the Chennai builder has developed many plotted developments to make the plot seekers profitable. The project offers plots, villas and row houses and shopping complex. The project is well equipped with all modern amenities and 24 x 7 security service to facilitate the needs of the residents. The plot development being a gated community has been loaded with many amenities such as fully landscaped parks, 3 Years hassle free maintenance, Vaastu Compliant homes, Gated community, Avenue trees, Clubhouse, Swimming pool, Rainwater harvesting, Children’s Play area. Premium plots sizes of your choice and Ground level and overhead storage for water. Behind Saveetha Medical College & Engineering College,just 3.km from Arlington County. Just 200m to Reach Apollo Matric School & college. 1.5 km to reach Sri Padmavathi Engineering college . 12 Major Engineering colleges can be accessed within 5 - 10 mins drive. 2 kms from the Proposed Satellite Township . 2 km before ETA STAR ‘Le Chalet’ Project . 2.7 Kms from Chennai – Bangalore Highway (NH 4). 3 kms before Hyundai & MRF race club. 3 kms before ‘Mahidhara Central’ Project . 3 kms from Queens Land theme park & pleasant day hotel . 3.1 kms from Chennai – Bangalore Highway (NH 4) which is now 6 Way Track . 4 kms from Godrej homes & Rommas apartments . 5km distance to reach Irungattukottai Sipcot (1843.48 Acres) . 11km from Poonamalle Bus Stand . 15km distance to reach Sriperumbudur Sipcot (1832.70 Acres) . 18 kms before Nokia , Dell , caparro & Samsung , Saint- Cobain glass factory . 18 kms before the Proposed Green Field Airport . 19 km before Sriperumbudur Dry Port . 26 kms from Koyambedu Bus Terminus.